Ready to do battle with the meanest of the bull reds. Designed to hold up to 150 yards of 12-lb. test line, the Quantum Catalyst PTs Baitcast Reels feature a machined-aluminum frame and sidecover, a seven PT bearing system, a Micro ACS cast control, a smooth ceramic drag system, and a six-layer Saltgard corrosion protection system. 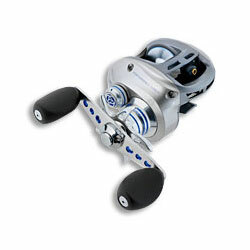 "i like this reel for bass and walleye and it is smooth reeling"
"Just got this reel the other day when my curado-d broke, this reel is smoother, lighter, and casts better than my shimano plus it's cheeper"